In the Studio: What Happened in March? Well, that plan didn't work very well. I missed all of March. So be it. I did get a lot of things accomplished but not blogging about it. If doing something new is about building the habit and building the habit is about a trigger, doing it and then getting the reward of the doing, blogging has not hit that mark for me yet. Time Time Time. I'm using something simpler for my studio record: Day One, a simple elegant calendar based journal app -- which does not, in the version I have, support the desktop MAC OS, Here's snippet of what it looks like and what my month of March looks like. IT's a great app, so take a look -- and maybe I'll expand to the desktop version this month and try blogging from it! The pages below can be scrolled through to show you the different views of your posts. Here's how I did this month 13 out of 20 days posting (I only set up the habit for serious about the 12th of the month while doing my planning of my ideal studio life.) The emphasis here is on tracking actual studio progress, not other work or art business, though sometimes that sneaks in as well. By the way, I also am continuing to use my tear away RMINDER lists on my desktop for daily, weekly and monthly TO DO lists. I love Todoist, but I found I could just get lost in it, is does SO many things. I'vm better off using my iCalendar for events, meetings, deadlines and time based appointments and REMINDERS for my priorities each day. It is SO satisfying to click off the little bubble and see the task disappear. Meanwhile, here are a few pics of iPad experiments done as part of my online COLLAGE ON THE IPAD course. The next session of ART ON THE IPAD starts early May, so if you are interested in getting the most out of you iPad as an art tool, take a look here. Geometric design don in a children's shape app, taken through Waterlogue. And a bunch more versions using other apps to alter the original. Lots of interaction with my online classes this session, Art on the iPad is rolling along, Collage on the iPad starts the first week of March. Playing around with Drawing Pad to work on my own Challenge iteration for the course. Another Agave of course! This might be Experiment Piece #3. • I had to postpone the second Artist Journey/Artist Journal workshop until February 24-26. Still have room for one more participant! We're taking a look at Julia Cameron's latest version of the Artist Way, It's Never too Late to Begin Again. • Slow stitching on experimental work #1, it's taking a lot longer than I thought it would. We are talking LOTs of stitches here. But this is a kind of meditation, with thread and needle in hand. By the way, my favorite needles are Gold Eye Quilt Basting Needles. • Paper Rustling this past week has gone swimmingly! I have even gotten started on tax return info. Would love for this to be more automated next year, so I am looking at Mint and Fresh Books. Other ideas? • Collecting and organizing some testimonials for Summer Art Camp, 2017. I have not added those to the website yet, and think they will help me move forward on enrollments. Do you read testimonial statements when you choose classes and workshops? • Tweak Week 5 of Art on the iPad; fill out Week 1 of Collage on the iPad. (True confessions here, I do my best to stay a week or two ahead as I work on these online courses, "just in time" design process. Feedback as I go along helps me refine the materials, and the deadlines make the task real! • Host Lyric Kinard on ZOOM meeting with SAQA, Thursday at . If you are a SAQA member, be sure to tune in! Topic: What a traveling quilt teacher needs in her bag of tricks. BTW, I'll be presenting a program in May featuring the SAQA Trunk Show at the FASA -- Fiber Artists of San Antonio -- meeting in San Antonio. • Yoga Studio stretches every morning and evening. I like having a guide for my practice and following auditory prompts makes it easy for me to stay the 15-20 minute course. If you have a Mac, put your SHORT (3-5 items) to-do list on the desktop with REMINDERS. The task list will update without splitting it from the primary app, but the pinned Reminders lists take up much less space and are cleaner looking, making them more suitable for leaving around on the desktop. As long as the Mac (or iPad/iPhone/iPod) is online, the lists will automatically update to reflect changes made from any other machine using the same iCloud account. Our house has windows that open to a box canyon and seven hills. The photos don't do justice. There is no capturing the deep and rocky, cedar covered 20 mile view up the Medina Valley. The walk down the hillside is full of rockslides, rolling stones. Walking stick imperatives. I forget to look some days and then suddenly I do. This month the cedars are orange tipped with pollen and the skies are ribbons swirls of greys, pinks, pale corals, blue and clouds trying to find a place to rain. The sun is lowered and softer and welcome, not like August's rage and roar, a softer song of light. I've never tried this out-the-window vision in my work. Is it too intimate, too homey? Too hard and too soft at the same time? It is a view both far and near, no majestic rock shape, just softened cedar hills that layer one upon the other and build the famous false horizons we take for everyday magic. Some mornings the fog pools like lake water and gives us that waterfront lot we imagine. I can't find the way to make it shape enough; it's just all texture. Maybe I can try it when I wander back to landscapes in my art work. Right now I am yearning for closer views. Because of the long visions of Big Bend this past 18 months I'm thinking about microscopes and macro views. Triptych: Borderlands, three pieces each 40" by 40" The big vistas. Looking for balance in all the tight places. 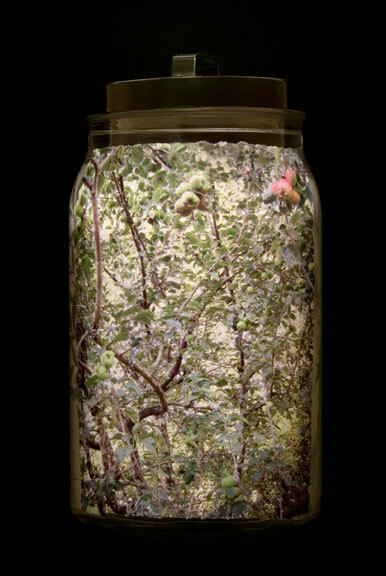 Despite the lack of my artist attention to the landforms and hidden road outside the window, what grows and wilts and multiplies in pads and pods and leaves is still in sight in my art. Closer invites attention. When I close my my eyes and speak my vocabulary of shapes, the vowels start with leaves, the consonants with spirals inside shells. The grammar of pomegranate seeds and round robust rich roundnesses that burst and grow and roll around the surfaces of my art. Obviously, I am not alone in finding something to think about in the natural world. Below is an excerpt from the interview with author Tina Welling by Arts & Healing Network Director Mary Daniel Hobson. The Arts & Healing Network is now closed, but its archives have some powerful thoughts and images. While Tina Welling is talking about writing, I think many of us visual artists have much the same experience working in and about nature. Mary Daniel Hobson: Tell me a little bit about your creative journey, and how you began to use writing as a way to connect with nature. Tina Welling: I began journaling and writing creatively as an urge to know myself. And that resulted in an expanded sense of awareness. I experienced changes that opened me to my body and to my greater body, the earth. I became more connected to who I truly was, while also engaging in a deepened relationship with the mountains, meadows and forests around me. Writing down what I was experiencing enhanced my relationship with the outdoors, while being outdoors supported my creative energy. Mary Daniel: Why do you think that writing in connection with nature can be such a healing catalyst? Tina: Nature and our personal creative energy are one thing, governed by the same rules and rhythms. When we align ourselves with the energies of the natural world, we expand into greater aliveness. When I'm outdoors in a safe place, I can open myself to stillness, connect with my essential self and be nurtured by all the life throbbing above, below and around me. Lessons and patterns for living well are everywhere in nature. We are reminded that like the earth, we live with seasons of producing and rest, and that we must attend our inner lives just as the trees and plants grow their root systems. We know we must act out of our authentic selves, just as each species of bird and animal life do and we enjoy a sense of healing when we experience oneness with all of life about us. Have a look - and wander into the areas other than textile. It's time to stretch, the start of a new year, filled with possibilities. Yep, it's just a date on a calendar, and culturally limited even. But we all feel a little surge of new when that date rolls over, right? http://hyperallergic.com/ is filled with art news from the world, big art, little art, political art, artful ideas! And speaking of stretching and working in different media -- my 2017 Summer Art Camp at The Camp at Capilla Peak in New Mexico will be a wonderful play fest of materials, different media, the summer camp stuff you loved as a kid (or maybe never got to experience) and the company of wonderful art explorers, both beginners and experienced. It's an experience you have to have to understand, a magical mix of clouds, pines, cabins, campfires, conversations, open studios, instruction in printmaking or metal work, surface design on fiber and even art on the iPad sessions on an individual sign up basis. What more could you want from summer fun. See the details on my website at http://www.susiemonday.com -- the summer camp page. Its not all serious art..
Dale Jenssen will be the focus artist for session 2, July 6-11, teaching metal work with sconce making, boxes and a variety of big and little projects. For fabric design or mixed media, an iPad is an amazing tool. Find out more at one of my workshops on Friday. After getting the exhibit up and running I'm turning my attention to my classes at the International Quilt Festival in Houston. Here's my rundown! 545 Art on the iPad—Just the Basicsclosed? 581 Drawing and Painting on the iPad -- closed? Dig through your past in this guided adventure to (re)discover your creative self. Science says we are all born creative, but many of us lose confidence as we age. 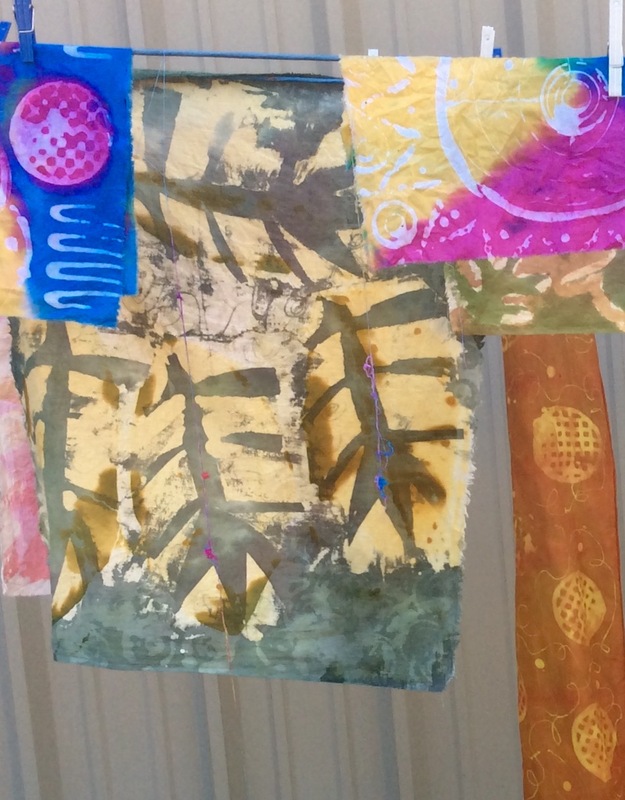 Discover the artifacts that will awaken creative growth in this fun mixed-media class taught by a creativity expert. Supplies—paper scissors; glue stick; eraser; paper, pen & pencil; note/sketch paper; scotch tape; photo of self as a child or young person (photocopy); favorite collage materials (opt). What inspires you? Create a one-of-a-kind card deck to spark creativity, take you out of your creative rut, and move you into art-making and imagination. Collage and design your way to a new studio ritual with a variety of mixed-media techniques while working with a creativity expert. Color inside and outside the lines in this fun and relaxing coloring class. Try a variety of coloring tools, see a demo for designing your own coloring pages from photos or your own art, and learn some color scheme tips, tricks, and rules that transfer to quilt design. A coloring page can become a quilt! See what this exciting event is all about! Six of the top mixed-media artists from the Quilt Festival faculty will present this focus, coordinated by Marlene Glickman. Each will give a digital presentation or show-and-tell of her particular expertise. Then, you can spend 15 minutes with each artist as they demonstrate the topics listed below. Go home with a handout from each designer, new ideas, information on products and processes, and lots of enthusiasm. Lyric Montgomery Kinard - Photos + Foil = FUN! Susie Monday - Easy Stamps for Fabric Fun Pattern fabrics using stamps with your own designs with craft store craft foam, meat trays, and a variety of found materials. Works on paper or cloth! Learn the basic iPad how-tos that take you into art and design for quilts and fabric. Organize, import and export, and go "fingers-on" with four teacher-recommended apps for photo-editing, special effects, and pattern-making. Supplies—paper, pen, & pencil; iPad tablet (any size, any generation with current IOS); charger; cord. Apps to download will be e-mailed to students one week before IQF begins. Spend start up time with four popular apps that are perfect for travel journals, photo-to-drawing, design on the fly, and pattern design. See demos for making print-at-home fabric and print-on-demand yardage with a company such as Spoonflower. Supplies—paper, pen, & pencil; iPad with current IOS; cord; charger. Apps to be downloaded provided one week in advance of Festival by e-mail. Starting with personal photos and simple in-class design exercises, learn to use four different digital collage techniques on the iPad for fabric or art quilt design. This class uses both the iPad and hands-on materials. Supplies—paper, pen, & pencil; iPad with current IOS installed; charger; cord; apps to download sent one week before Festival begins. Thirty-one Festival teachers at separate tables around the room offer continuous demonstrations of particular techniques and methods. Students circulate around the room informally. Enrollees receive a booklet consisting of a handout from each participating teacher. Friday Sampler (555) follows the same format, but topics and teachers vary. Six teachers from the Quilt Festival faculty will present this focus, coordinated by Cindy Walter. Embrace the season and enjoy creative gifts and ideas for Christmas as each presenter begins with a digital image presentation or show-and-tell of their work. Then spend 18 minutes with each teacher as they demonstrate their seasonal specialty. Subscribe to my monthly email newsletter by clicking this photo to link to a form. What gets you to the strongest work you can make? Is this about style. genre, subject, time, luck? There's been a good amount of chatter about developing one's personal voice or style lately on the quilt lists I follow -- is it developed or discovered? Where you start to develop a personal style in your art (no matter the media, genre or intention) you begin with discovery: experimenting, trying something a friend is doing, taking workshops or online classes with a teacher whose work you admire. Snake Woman (here in process) embodies a lot of what I think of as my personal voice: narrative, myth, color, texture, iconic imagery. I like what this painter blogger, Lori McNee, has to say -- though some of it has me thinking, maybe not that tip... What do you think? If you'd like to spend a weekend taking the step from discovering to developing, sign up for my Artist Journey workshops coming in January. This year, due to demand, I'll be hosting two weekend retreats at El Cielo, each with a slightly different set of play books! Read more on the website (scroll down past the Temple and IQF events) and send me an email if you are interested. $25 nonrefundable deposit. If you are seeking a rich guide to forging an original, thoughtful, beyond-technique-trickster gimmicks, follow Jane's steps and see where you find yourself in a few months of self study. "Creative Strength Training is a treasure. I was inspired from page 1 onward. I know all about discipline - but now I know how to transfer it to creative pursuits." What resonates with me particularly -- beyond the abiding interest I have in this topic -- are Jane's examples and the thought processes she shares from those who have taken her courses. These snapshots of different minds and hands at work are inspiring and intriguing in equal part. * Receive support and inspiration from contributing artists who share how each chapter has improved their practice and helped them evolve. Order the book from Jane here or from another online retailer. Should you be traveling up IH35 north between October 14 and November 27 please stop in to see my new work and that of printmaker Junanne Peck at the Temple Cultural Activities Center, just north of downtown on N. 3. If you can come to the opening, we'll be staying overnight at America's Best Value Inn, 915 N General Bruce Dr, Temple, TX 76504-2479 (Formerly Red Roof).We'll also share a great Chinese Banquet with anyone who wants to join us after the opening. Monday’s new textile collage paintings explore the expanses of Big Bend, the roads traveled without and within— especially the paths of women -- and the legends that arise from those journeys inside and out. Peck’s etchings and monotypes express images that spring from her dreams and meditation, tapping into hidden resources of joy and expansion. Together the two women, whose art and teaching have brought them together, find find inspiration in nature, story telling and the power of images to make us think, feel and delight in the world. For workshop info, see my website. I've jumped into some new ventures given the opportunities at the Temple Cultural Activities Center -- notably putting some of my designs up on the retail site RedBubble.com. Here's a few app suggestions for the Adventurous Inner Critic Creatives. Turn your inner critic into a scary, horrible archetypal image. I use my iPad and apps, but we've also tackled the project by making scary dolls, impossible puppets and collage pictures to express exactly how that inner demon makes us feel. Use CartoonCam to picture that inner leering monster looking over your shoulder (photo above). Toon Dream. You could print this one out and make her into a doll! You can actually make cartoon strips and books with this app if you want to have an extended conversation with your critic. Make a word picture picture of your critic's inner diatribes with Visual Poetry or aTypo Picture. Giving Actual Voice to the IC is a way to make those inner dialogues dissipate pretty fast -- they start looking and sounding pretty silly. My inner critic at times looks like this petroglyph, (our version at The Camp at Capilla Peak) a hatchet bearing, shield wielding panther woman. You may have more uplifting solutions, but I have to be honest: reality TV keeps me real. I turn on cooking shows or Project Runway or something similar when I am designing in the studio -- I don't really watch or listen but somehow the sound and audio keeps my inner critic occupied while the rest of me gets on with it! Poking around looking for more ways to silence that inner critic, I found several posts and ideas -- many of them are ideas familiar, but they bear repeating. Psychologist and artist Lynn Newman on Tiny Buddhashares"5 Immediate Ways to Silence your Inner Critic." Try this exercise from Tasha Harmon, coach, to find out the real purpose that inner critic is hounding you. From the blog Beyond the Dream, "12 Ways to kickstart and boost your creativity." One of my "mentors in print" Julia Cameron recommends that one give a name, personality and face to the inner critic to give one an even chance at talking back. "I have an inner critic, a censor, whom I call Nigel. Nigel in my imagination is a gay interior decorator, who is British. Nothing I ever do is good enough for Nigel. I think all of us have our Nigels and sometimes people come to me and they want me to eradicate their censor. The censor never goes away, unfortunately. But we can learn how to work with it." Read and work The Artist's Way if you really want help with that nagging critic. It worked for me! What is gained, what is lost -- maybe its time to break up? "Lazy bum," my inner critic murmurs. This is after exactly four days post a fabulous farewell brunch with 18 campers and staff members after the third season of Summer Art Camp at The Camp at Capilla Peak here in New Mexico's Manzano Mountains. I say back, "Give me a break...."
For the self-employed artists among us (and I suspect others, too) taking a real break from work (and the play that sometimes feels like work and the work that sometimes feels like play) can be a challenge-- mental, physical and spiritual. Even loving what we do and doing what we love (especially so). But summer, fall, spring and winter and even daily "breaking up" is essential to the creative process. Without time to refill, refresh, restore, relax we not only tax our physical selves, but we can run out of the courage to create anew. Recycling ideas is okay for a while, but it your work is feeling stale or slightly boring, maybe you need to break up with it for a while. The most difficult part of the process for me is silencing that toxic inner voice that says "Push on, push on, there's more to be done and not enough time to do it." This mid-summer newsletter is an attempt to placate that voice, and yet know that porch-sitting, bird-watching, do-not-much time is waiting with the buzzer. Yep, put on the buzzer, folks. Breaking up is easier with a buzzer. Give yourself the hour or two for the most pressing chore, then do nothing for a while. It gets easier, the more you practice breaking up with "the voice." The second installment of pattern inspiration blogs this month. If you didn't get the newsletter that started it off, follow this link! Here's a great collection from creative bug, a website/blog/newsfeed devoted to all things design. One of the featured artists is Hope Little -- her geometric animals (right) could inspire an amazing pieced quilt! Another animal pattern inspiration comes from National Geographic -- a great source of photos and images for art. 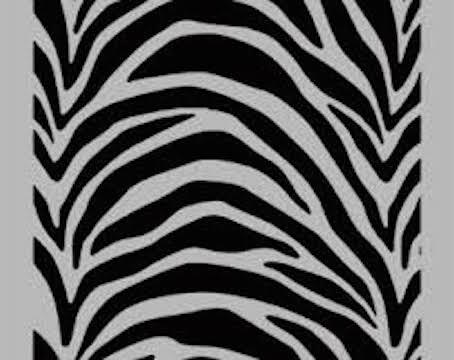 And finally, a few animal print patterns that could inspire thermofax designs, screen printing or even a hand cut stencil! If you'd like to know more about editing photos with iPad special effects apps, consider taking my Art on the iPad online course! Or take my workshop at Quilt Nebraska this summer! Searching the Web for expert tips for surface design gave me a slew of possibilities and lots of ideas. I hope these are helpful to you as well! Pantone is the color expert that designers depend on. Their color forecasting is generally on target, and, if you want to design fabric or prints or even quilts that take advantage of color trends, this is the place to look. A clever and handy iPad app that will let you match HEX color codes to your photos, quilts, art or other source images is ColorViewfinder. A collage photo image of the Living Room/Dining Room windows at El Cielo. Come visit some time soon! Another set of tips from Digital Arts Online comes from Dinara Mirtlipova, Lotta Kühlhorn and others. "It helps to have at least five shapes so that there can be a nice variety within the composition – the same shape will never appear side by side. Leaving space between shapes also provides flexibility to go back in and draw smaller details to help bring balance to the overall image." I've been trying to figure a new "FOLLOW" system for my blog, since I'm reviving it this month. If you'd like to see some short (usually anyway) and always visually inspiring posts from me ONCE A WEEK MAX, then go to Bloglovin.com and put in the feed for my blog. Thanks! This blog post repeats excerpts from my latest newsletter, with a few more pictures! The new Pattern posts start tomorrow! No surprise, I love patterns; Patterns in art, patterns in buildings, patterns on fabric, patterns that move, patterns of words and letters -- just about any pattern at all. Most recently, it's those natural patterns that have caught my imagination. I'm neck deep in designing fabric patterns for a new series of work based on my recent trips out to Big Bend and the Chihuahuan desert. In the Sensory Alphabet lingo, pattern equals rhythm, and i can practically hear the patterns I see and reimagine for my work. As rhythm, patterns are one of those design tools that "hold together" a composition. A pattern of shapes or colors or lines makes an image make sense, and helps us to connect it to other images and ideas outside of the picture frame. Of course, doing this work has taken me on a host of other less car-dependent journeys than were the two recent 700 round trip treks to Big Bend National Park. I've researched and explored countless pattern sites, apps and resources on the web. And this newsletter gives me a chance to share some of them. Big Bend photos and drawings transformed to fabric designs and textile art. The big share will come in October with the opening of an exhibit at theTemple (Texas) Cultural Activities Center where and I will collaborate with a large exhibit of textile art, prints and paintings. Junanne has been a teacher with me at my Summer Art Camp in New Mexico for two years and will be back (with metal and fiber artist Dale Jenssen) this summer. We'll also be hosting an opening and several workshops during the two month run of the exhibit. Stay tuned to this newsletter for dates to come! Spoonflower is the online POD (Print on Demand) site that I use for producing the fabrics that I design with the help of my iPadand Mac (mostly the iPad!). Spoonflower links my uploaded art to an online editing site called PicMonkey (you can access it -- with even more tools available from your desktop, too)> It's a disrupter for sure, no doubt if you sew you've seen the news that Hancock's is going out of business. With online sites for fabric purchase and even the ability for textile people like me to design my own fabrics, it's another sign of the times. A fabric store today has to offer something really special, have a niche market or cater extremely well to a loyal client base. 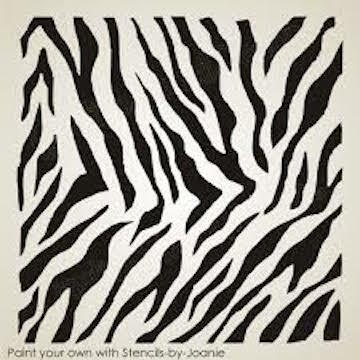 With Spoonflower, I can upload a simple image. This pomegranate design is a rough, really rough, seamless design (see below) that I cut from construction paper and photographed to use as a repeat. I uploaded it to Spoonflower, then made variations with its repeat tools and using PicMonkey. The possibilities are endless for just one simple design. If I want a related group of fabrics, all I need to do is tweak! Soonflower even gives me ways to change the colors of a design to make the same pattern in a different color way. You get the picture!